We're Awakening! : Up In Arms Tour Kicks off today! Up In Arms Tour Kicks off today! What better way to start it off than to take a look at a new story that the Augusta Chronicle did with Switchfoot's very own master-of-all-trades, Jerome Fontamillas. He said that although success has made it more difficult to engage individual fans, band members still want to make the music and themselves accessible. "The more people hear you, the more a piece of you needs to go out," he said. "I mean, when radio plays you, when you are on TV, people want to know about you. And when that demand is there, you owe it to them to, in some way, make yourself available. It's actually something that's an honor for us." Although Switchfoot has been both praised and criticized for churning out radio-ready hits, Mr. Fontamillas said writing catchy pop-rock tunes isn't effortless. He said that for each track that makes it onto an album, there are several that will never see the light of day. "You have to work hard in crafting a song that people will listen to," he said. "Of course, John Foreman (Switchfoot's lead singer) is an amazing lyricist. But it is a process of sifting. We might write 100 songs, and I'll tell you, there are a lot of them that will be terrible." Romey, you don't know how many of us would love to hear the "terrible" songs that have been tucked away! Switchfoot will go from regular to goofy and then back again. They will slowly morph into the Bob Burnquists of the subtle-Christian-influence-VH1-rock sound. The first few ep reviews are rollin' in. Happy start of tour everyone! Thanks for linking to my review. Like I said there, my favorite song is "Your Love Is Strong," but they really are ALL stellar. Foreman never ceases to astound and amaze! You have a fine blog, by the way. I have followed it since its central focus was to propel "Awakening" to 1 million (and beyond) views on youtube. 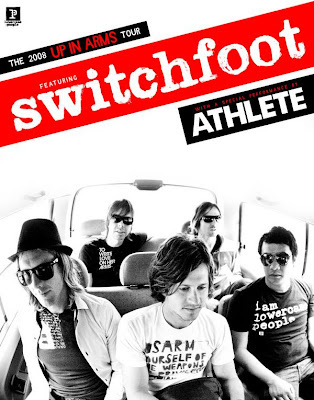 Now it is, in my opinion, the best Switchfoot "fan" blog out there (eclipsing the sadly stagnant Switchfeed). Jon Foreman's Spring Up For Previews! Breaking News: New name for The Real SeanJon! New Jon Foreman Show dates!